Josh Brown|Miami Valley Today file Miami East’s Austin Kearns sacks the Tri-County North quarterback during a Cross County Conference game in the 2017 season. Josh Brown|Miami Valley Today file Bethel’s Jacob Ullmer breaks away from the Tri-Village defense on a long touchdown run during a Cross County Conference game in the 2018 season. A fractured Cross County Conference could become officially split in the coming weeks. On Jan. 18, school superintendents, principals and athletic directors from the 14 CCC member schools met in an emergency meeting to discuss the future of the conference. Miami East superintendent Dr. Todd Rappold said four of the 14 CCC schools — Miami East, Bethel, Covington and Fort Loramie — were told at that meeting that the other 10 schools planned on exiting the conference. Miami East, Covington and Bethel all are located in Miami County. The schools that verbally announced their plans to leave the CCC are: Newton, Ansonia, Arcanum, Bradford, Franklin-Monroe, Mississinawa Valley, National Trail, Tri-County North, Tri-Village and Twin Valley South. Newton and Bradford are the only two of the 10 schools located in Miami County, the rest are in Darke and Preble counties. Since 2006, when Miami East joined the CCC after a stint in the Central Buckeye Conference, Covington has won or shared eight CCC titles in football (2006, 2007, 2010, 2011, 2012, 2013, 2015 and 2016), while Miami East has won or shared three CCC titles in football (2008, 2015 and 2017). Fort Loramie, which joined the conference in football and girls golf only in 2017 — the Redskins play in the Shelby County Athletic League in all other sports — won the CCC football title this past fall, while also reaching the Division VII state semifinals. However, in a memo obtained by Miami Valley Today that was handed out at the Jan. 18 meeting, the 10 schools that are leaving have expressed a desire to leave earlier than the two years stipulated in the CCC contract. 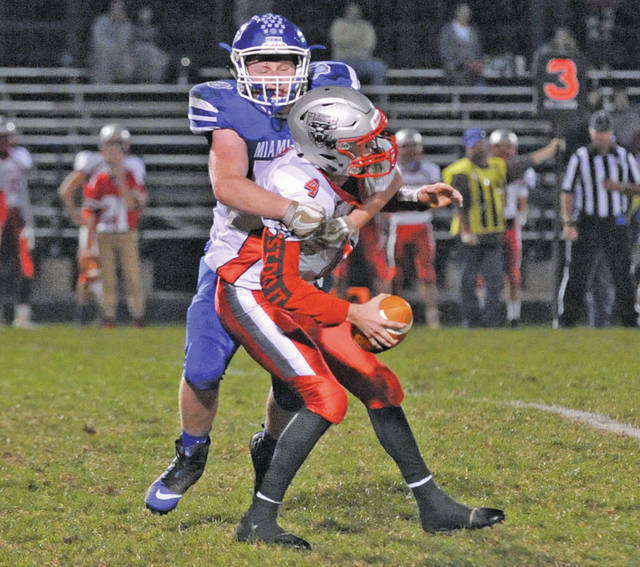 https://www.tdn-net.com/wp-content/uploads/sites/21/2019/01/web1_102017jb_me_kearns-2.jpgJosh Brown|Miami Valley Today file Miami East’s Austin Kearns sacks the Tri-County North quarterback during a Cross County Conference game in the 2017 season. 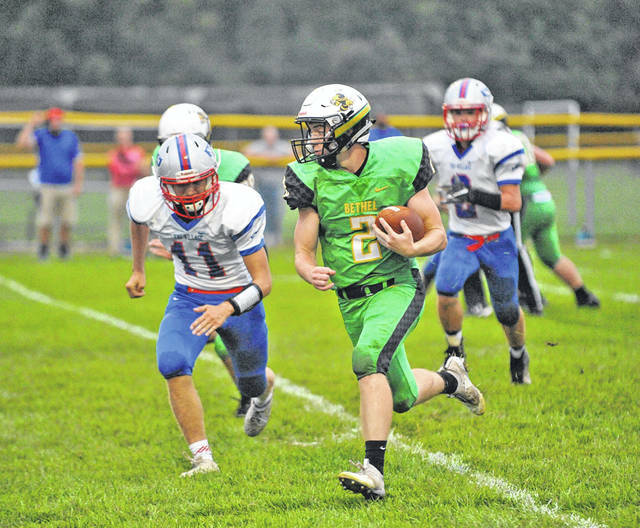 https://www.tdn-net.com/wp-content/uploads/sites/21/2019/01/web1_090718jb_bethel_jacobullmer-2.jpgJosh Brown|Miami Valley Today file Bethel’s Jacob Ullmer breaks away from the Tri-Village defense on a long touchdown run during a Cross County Conference game in the 2018 season.